Surround automatically tracks historical data about actions that users perform, such as adding, checking in, and moving files. But, what if a team member makes a change that another person has questions about later? What if the person who made the original change has no recollection of it or isn’t available to help? To make sure this important information is captured, require users to enter comments when performing actions. 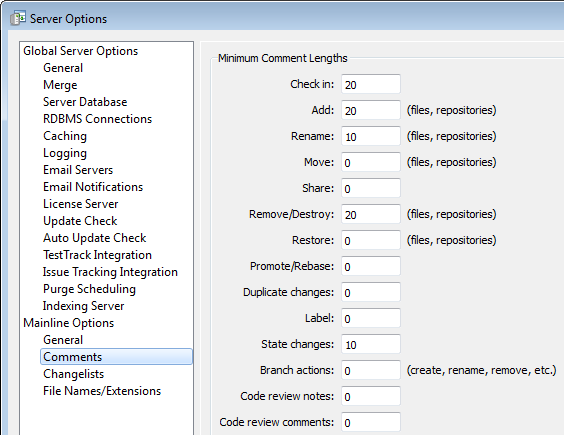 To require comments, the Surround SCM administrator sets a minimum comment length for actions in the server options. Previously, the minimum length applied to comments for all actions. Starting with Surround SCM 2015.1, you can specify different lengths for different actions, giving you more flexibility. For example, you may want to require a minimum of 20 characters for check ins, but not require comments for file renames. To set minimum comment lengths, choose Tools > Administration > Server Options. Select Comments from the Mainline Options category. Enter the minimum number of characters required in comments for each action. If you do not want to require comments for an action, enter 0. When a user performs an action that requires comments, they cannot complete the action until they enter the required minimum number of characters. Keep in mind that these settings apply to all branches and users, but you can override them for specific mainline branches. See the Surround SCM help for more information.